2007 Sun Tracker 18' Party Barge, 40 HP 4 stroke EFI, Trailer included $17,999. 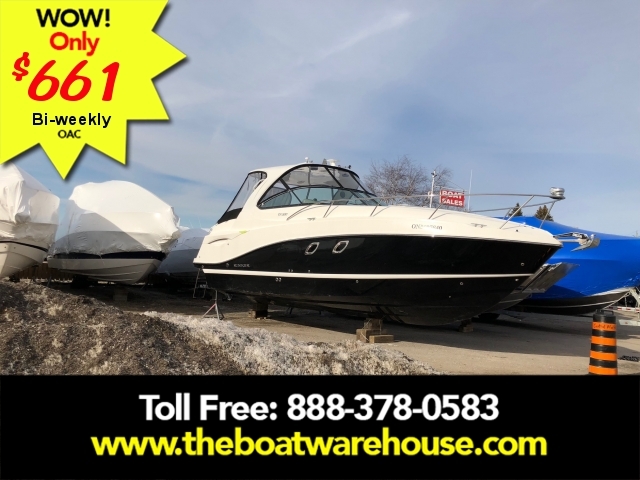 2011 Four Winns V285, 5.7 GXi Volvo Duoprop, 150 Hours, GPS, AC/Heat, Arch, Camper top, Cockpit cover, Windlass electric anchor, Much more, Nice boat, Must be seen, $74,999. Trailer not included. 2011 Four Winns V285, 5.7 ltr Fuel injected Volvo with Duoprop, 258 hours, Radar arch, Camper enclosure, Air Conditioning/Heat, GPS, Trim tabs, 2013 tri axle trailer included. Inside for viewing, Must be seen. Very clean, All regular service done. $77,999. 2017 Rinker 320ex. Twin 4.5L Merc with axius & Bravo III. Under 70 hours and lest than 5 hours on the generator. Everything is in great shape.